I cheated a little with this one. The theme “outer space” goes hand-in-hand with the fact that I’m a big fan of that galaxy far, far away. 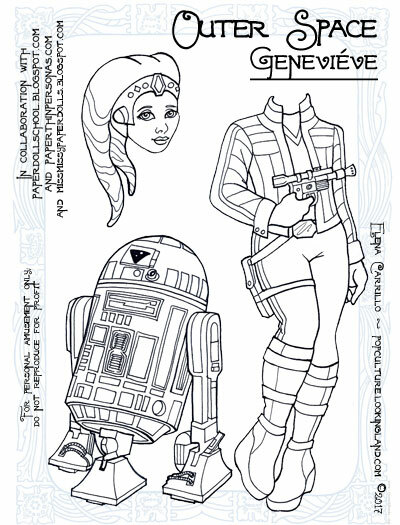 Immediately I thought it would be cool to make Geneviéve into a Twi’lek. 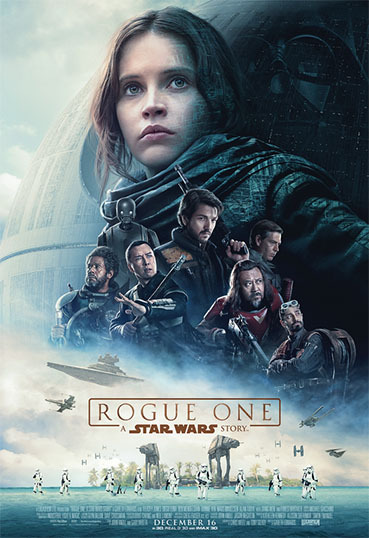 Or you can skip the extra head and she can be a cool smuggler or Resistance fighter using one of her previous heads. I also added an astromech in an attempt to make her a little more “outer spacey” since technically she’s not wearing a flight suit or a helmet or other gear you would associate with actually being, you know, in space. The astromech at least implies that she’s a pilot. It’s an R7 unit. Feel free to name it yourself. I hope you’ll forgive this indulgence. Rey is our first principal female hero in a Star Wars movie. I like her a lot and I wasn’t expecting to. Usually media overdoes it when it comes to female heroes. They’re too counter-culture, too dispassionate, too “badass” to be interesting. Just cardboard cutouts of their male counterparts. Men in skirts–which is not the ideal female hero to me. But Rey isn’t any of those things. She’s sweet, she’s fiesty, yes, but also uncertain; a fighter whose heart is more important than whatever weapon she lays her hands on. And yes, even that weapon. And she’s the perfect foil for Kylo Ren. They are yin/yan in this fantasy, which makes her not only interesting on a personal level, but a cosmic one as well. I’m very excited to see where her journey takes her. And if you are even remotely wondering, no, I am not the least bit interested in who her parents are. She is perfectly interesting all by herself. This first set of plates is the costume she appears in throughout most of the film. 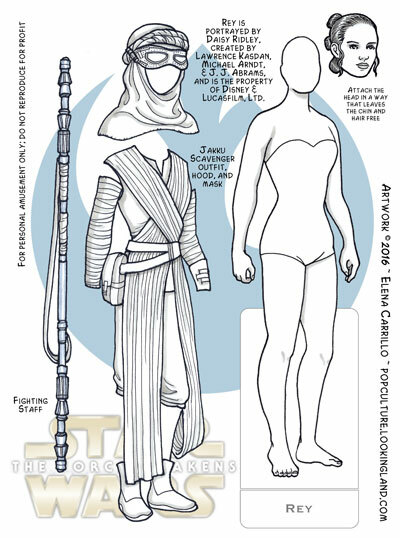 It includes her fighting staff with which she wards off trouble on Jakku. I have another plate for Rey that’s not finished yet, which has her Resistance outfit from the end of the movie. On that plate I will also include Anakin’s infamous light saber, which Rey uses to defeat Kylo Ren and presents to Luke on Ahch-To. 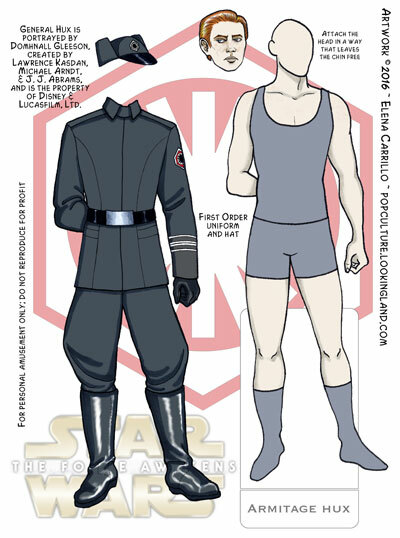 I really love most of the costume work in The Force Awakens. 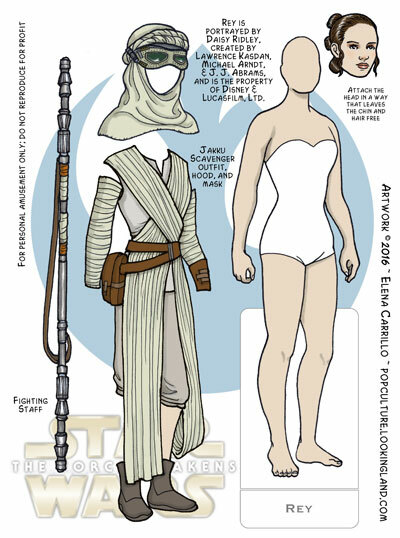 Rey’s long sash and her banded arms are especially appealing. 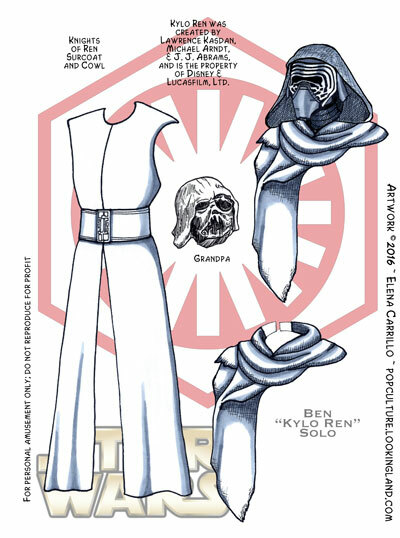 I also love the way she fashioned goggles from an old stormtrooper visor. These plates are dated from 2016. I made them a year ago last spring and never got around to posting them. I planned to do a whole set of Force Awakens dolls, but only got around to making Rey and Kylo Ren. 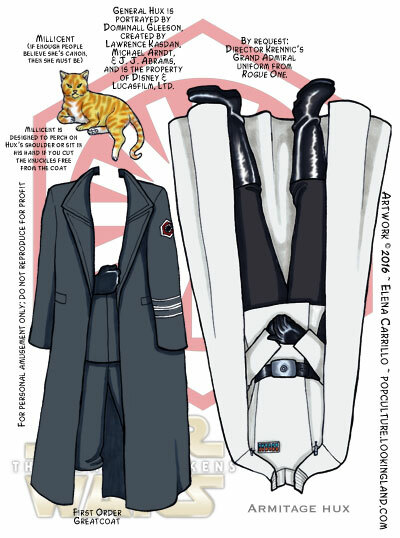 In the fall I had a request for a General Hux, and then just after Christmas I added General Leia for too-sad reasons. I thought I should at least finish posting the characters that I completed. 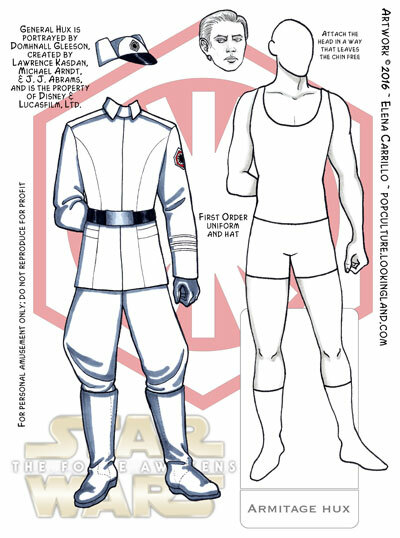 I’d still like to make at least plates for Luke and Han since it would just be a matter of making costumes and heads for the available bodies. We’ll see what I get up to. Next Friday I’ll post Kylo Ren. 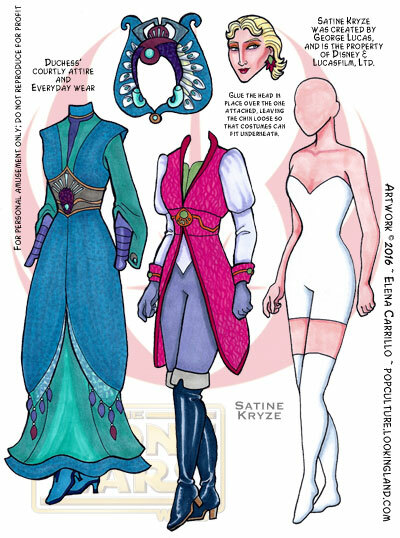 I didn’t want Ahsoka to be lonely in the paper doll world, so I made Satine Kryze, Duchess of Mandalore. Satine is an interesting character. She’s wise and powerful and has a doomed (though not unrequited) attraction to Obi-Wan Kenobi. She was so popular on the show that a sect of the fandom believes she may be the grandmother of Rey in The Force Awakens. I like her wardrobe because it’s full of interesting colors and textures. I might make another plate of costumes for her. 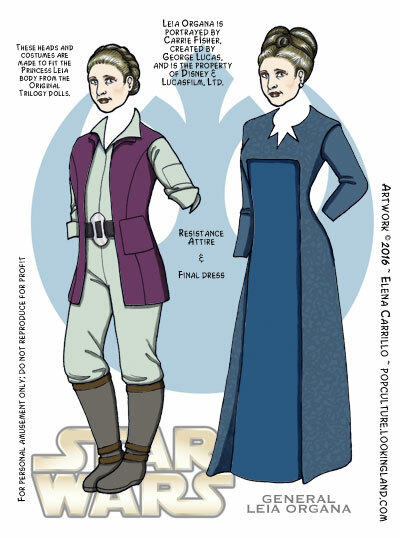 She had more wardrobe changes than many other characters on the show–still not to be outdone by Padme. A lot of people think Cate Blanchett should play her in real life. Originally I was going to draw her with Cate’s face, but decided to stick to the cartoon representation. I already chose that route with Ahsoka. These dolls are super easy to make. Did this last Saturday afternoon while futzing about. 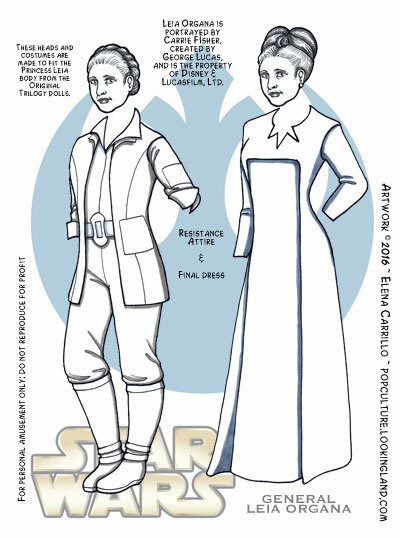 So I still might make Obi-Wan and Anakin and Padme. We’ll see. 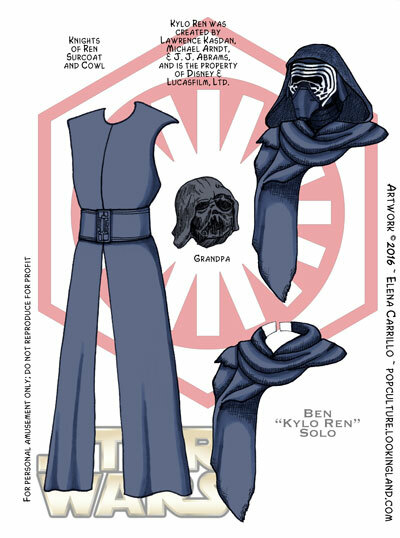 To see all Star Wars related posts and plates, click the tag or category at right. If I make more plates for Satine, click her tag (this is her first). Same is true of the Clone Wars tag to see all in the series. There are many things I’ve been working on, but of course I knocked this one out quickly just to distract myself (because isn’t that always the way of it?). I recently finished watching the cartoon series The Clone Wars and though I didn’t really like a lot of it, it did have good things in it. 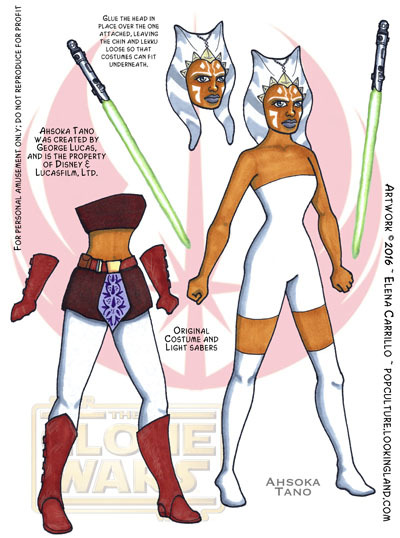 Including the character of Ahsoka Tano who turned out to be pretty cool. For the doll I only made the few outfits I remembered well enough over the span of the six seasons. 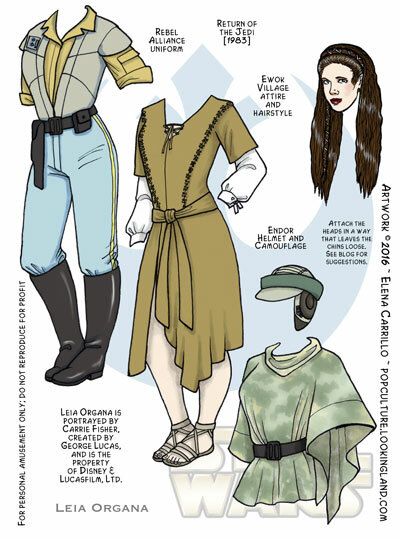 Cartoon characters don’t typically change their clothes much (though, as always, Padme is an exception in the series). I honestly don’t recollect Ahsoka wearing much outside her usual gear (a coat and a cloak, perhaps, but those didn’t seem very interesting to draw–for the moment). 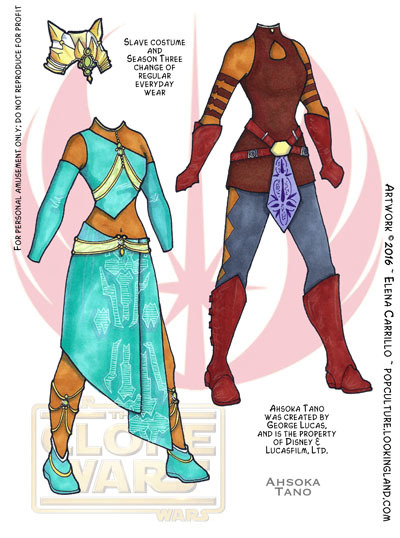 She has a new costume from her appearance in Rebels, but for the moment I am sticking with her Clone Wars outfits. N o black and white versions, though. 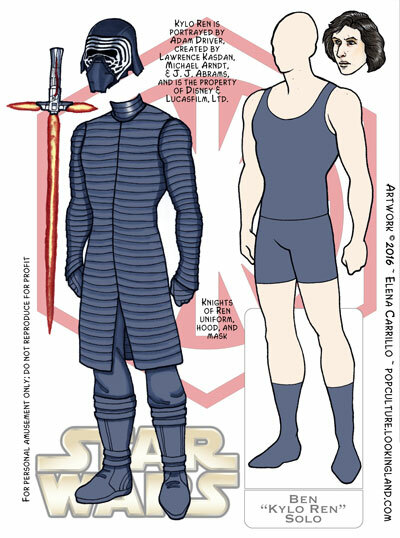 I gotta say: doing the two styles was really trying for me when I worked on the other Star Wars dolls. I know people like to have the option of coloring their own, but it really doubled the work. 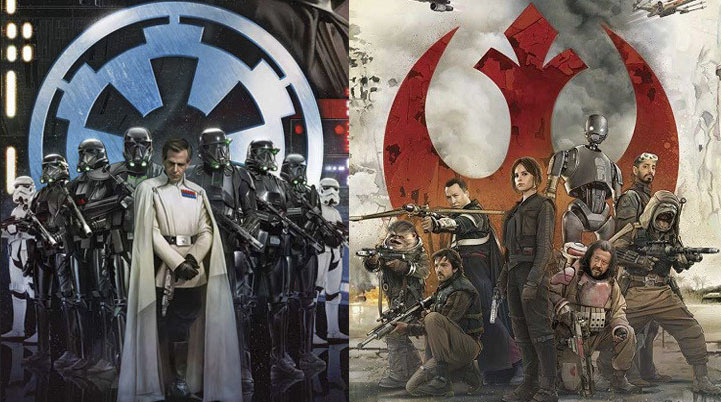 I’m going to struggle with the Force Awakens characters. I’m seriously considering not making colored versions (especially since everybody wears so much dang black!). I am tempted to do other characters from this series. Mostly because making this one was surprisingly easy. Cartoons are fun because they are typically pretty colorful. Did these almost completely in Copic markers. Not too awful for a rush job and I like some of the details that actually came out. Though I didn’t love the show, the designs on it are definitely fun to draw. I very loosely drafted Anakin, Padme, Obi-Wan, and Satine, but again, I don’t know whether I will follow through on them. Maybe eventually. As yet another side project. To see all Star Wars related posts and plates, click the tag or the category at right. If I make more plates for this character, click the Ahsoka Tano tag to see all the plates (this is her first). Same is true of the Clone Wars tag, if I decide to make other dolls. At long last, this is the final plate for the Star Wars Original Trilogy series. While I fell short of my original goal of including Darth Vader and the droids along with our OT heroes, I’m fairly pleased that I managed to at least finish all the base costumes. 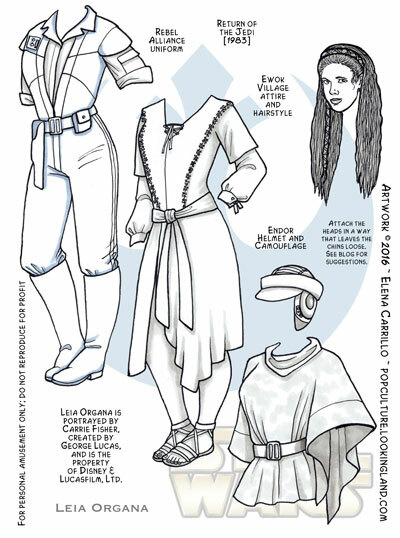 Here Leia is wearing her final outfits from Return of the Jedi. I also included her hair-down style from when she’s in the ewok village. She has more costume changes in the final movie of the trilogy than anyone else. No one can beat Padme in the Prequel Trilogy, though. Carrie Fisher’s joke is that she got a new dress every time she walked through a doorway. In case you are at all wondering whether I will be doing those characters, emphatically no. 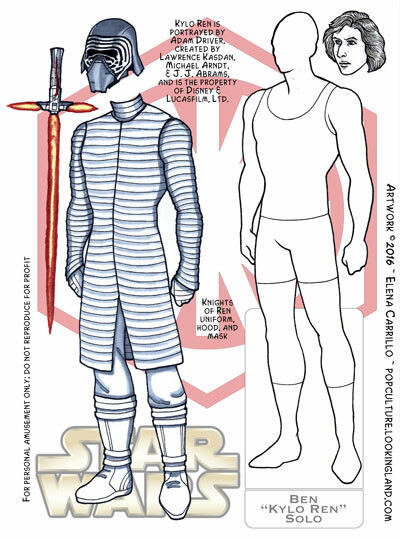 Besides, as mentioned before, there is already a nice set of Amidala paper dolls out there already. I had wanted to challenge myself to do things differently with this series. Like including printable black and white versions for you to color. I focused on basic linework instead of the usual painting I have typically done for my paper dolls. Really wanted these to be more stylized, but didn’t get there. I think I mentioned before that I intend to just resign myself to the fact that this is my style. And that’s okay. Lastly, I meant to get silly with these (it all started out as a ridiculous idea of having a Skywalker-Solo Family Picnic), but I never quite got there because I started to take it all too seriously. I kind of regret that. Sometimes I think: well, I’ll go back and supplement stuff, but my track record with following through on that sort of thing is pretty poor all things considered. So that wraps it up! I don’t know what’s next for me here. Maybe The Force Awakens, but I’d like to start doing some original stuff as well. I have a lot of things that got left in the wings that I’d like to pick up again if I can get organized. Even if it’s stuff I have personally lost interest in pursuing. I might at least share some bits of it since it seems a shame to just leave it to my cabinet. To see all Star Wars related posts and plates, click the tag or the category at right. 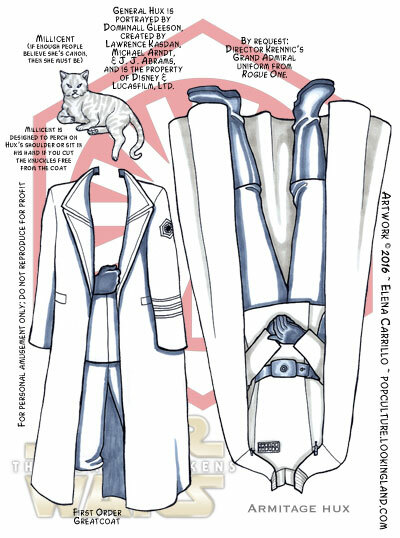 Click the Leia Organa tag to see all of Leia’s plates (this is her last).